Phonic Sounds Desk Charts – One desk chart each for vowel and consonant sound/phoneme with associated letter patterns /graphemes. 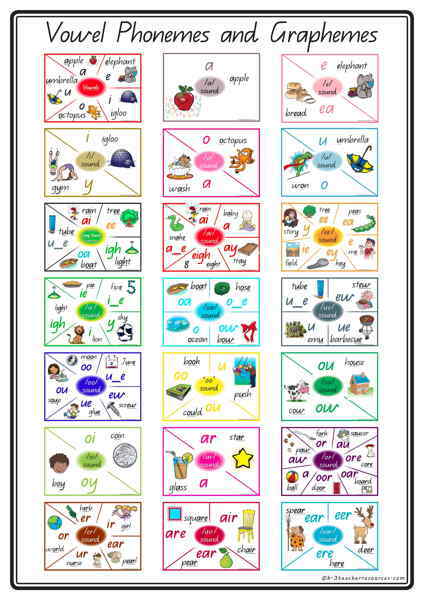 Great to have on the desk top (use clear ‘contact’) – ‘teach’ the children how to use the reference chart – lots of ‘listening’ to the sounds – relating them to words around the room, in their reading, matching them to the sounds on the chart. Play around with the chart and the sounds – for example: ‘who can find the word ‘sunny’ in the room – what is the first sound you can hear? /s/ find this sound on your chart – which letter pattern (grapheme) does this word use for the /s/ sound? etc etc..
Have a laminated class set available for children to grab for writing / spelling as well as on desk tops. I use them with my boys’ homework or when they ask how to spell a word! – We clap out the syllables – listen for the sounds within each syllable – write the grapheme for each sound using the sound charts as reference if needed. Print them off as take-home reference. These are terrific for use during writing editing and for spelling/word study reference. Ideal for reference during writing sessions, word study, spelling, shared reading, syllable/sound mapping and general word play and literacy activities. Final Consonant Blend Cards are not FINAL Blends. I am only seeing a repeat of the Initial Blend Cards. I want to have a complete set. I LOVE your products! Very professional and attractive AND spot on! !